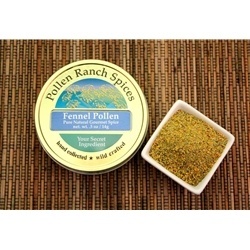 Fennel Pollen is a very popular seasoning in a large variety of food. We know you will enjoy adding these products to your pantry. We even carry fennel pollen for desserts. We carry Organic Fennel Pollen, Dill Pollen, Big Devil Pollen, Divine Desserts Pollen, Hog Heaven and Zen-Sational.